Algeria is located on Mediterranean Sea, and borders Morocco to the northwest, Tunisia to the northeast, Libya to the east, Niger to the southeast, Mali to the southwest, Mauritania and Western Sahara to the west. 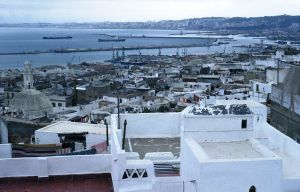 Algeria’s capital, largest city, and cultural center is Algiers. It is the largest country in both Africa and the Arab world by land area, and the tenth-largest country in the world. The territory of today’s Algeria was the home of many prehistoric cultures, including Aterian and Capsian and the Proto-Berber, as well as early empires and dynasties including Numidians, Phoenicians, Carthaginians, Romans, Vandals, Byzantines, and others. More recently, it has been under Ottoman and the French colonial influence. While 90% of the country is desert, there can be substantial variation in terrain, from sand dunes to mountainous areas filled with rock art. Most of the coastal area is hilly, sometimes even mountainous, and there are a few natural harbors. The Ahaggar Mountains also known as the Hoggar, are an important highland region in central Sahara, southern Algeria. Algiers is the capital and largest city of Algeria, located on the central Mediterranean coast. The most of the interesting for most travelers is the old part of town, which is a UNESCO World Heritage Site, where there are the remains of a citadel, old mosques and Ottoman-style palaces. Also popular is the enchanting promenade along the seafront. Djémila is a small mountain village in Algeria, east of Algiers, that is home to a UNESCO World Heritage Site. The exceptionally well preserved ruins, also known as Cuicul, were built on small plateau with significant surrounding buildings including a theater, two fora, temples, basilicas, arches, streets, and scattered houses. 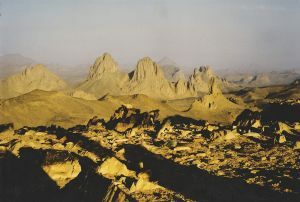 The Hoggar Mountains are a highland region located in the central Saharan part of southern Algeria. Since the elevation moderates the climate relative to most other areas of the Sahara, the Hoggar Mountains are a major location for biodiversity and host relict species. The mountains are also home to a collection of rock paintings from 6000 BC. 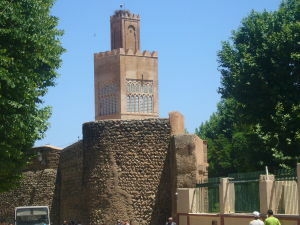 M'zab is a UNESCO World Heritage Site located in north-central Algeria. The five ksour (fortified villages) that make up the valley demonstrate in extraordinary pocket of sedentary and urban civilization. Each is surrounded by walls and dominated by a mosque, while houses built in concentric circles up to the ramparts. Tassili n'Ajjer is a national park and UNESCO World Heritage Site located in the Sahara Desert in southeastern Algeria. The erosion of the sandstone mountains has resulted in hundreds of natural rock arches and other forms of weird geology. The area also hosts one of the most important collections of prehistoric rock art in the world. 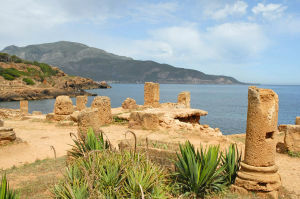 Tipasa is a charming port city on the Mediterranean coast of Algeria, best known as the home of three archeological sites that form a UNESCO World Heritage Site. Tipasa was an ancient Punic trading-post conquered by Rome and turned into a strategic base for the conquest of the kingdoms of Mauritania. Numerous and diverse necropolis testify to the multicultural exchanges of the time. Tlemcen is a city located in northwestern Algeria whose moderate mountain climate have long made it popular with travelers. The city has a rich history of multicultural interaction, combining Arabic, Islamic, Berber, and Andalusian influences in its music, arts, and other forms of culture. It is also known its olive plantations, vineyards, and generally relaxed and tolerant style.